At Platte Woods UMC we believe all people have a call placed on their hearts by God to spread the good news of God’s love in Jesus Christ and serve in response to that love. We believe the Holy Spirit empowers and gives us everything we need to accomplish wonderful, adventurous and challenging acts of mission. Our call as part of the body of Christ is to serve those in need. Come serve and seek justice with us! Below are just a few of the opportunities available through PWUMC. For more information about missions and service at PWUMC, please contact Brandi Molina, director of Missions. We have a growing need for friendly faces to greet and welcome people. We want to ensure a spirit of hospitality from the parking lot attendants, Connect Desk, ushers and beyond. If you can help welcome our members and guests, please call the church office at 816-741-2972. Our Missions Teams serve throughout the year, receiving notifications of various opportunities and choosing those that fit your schedule. If you would like to join or learn more about any of these teams, please contact Brandi Molina, director of Missions. Food Team: If you have a passion for helping feed hungry people, we would love to have you as part of our team. 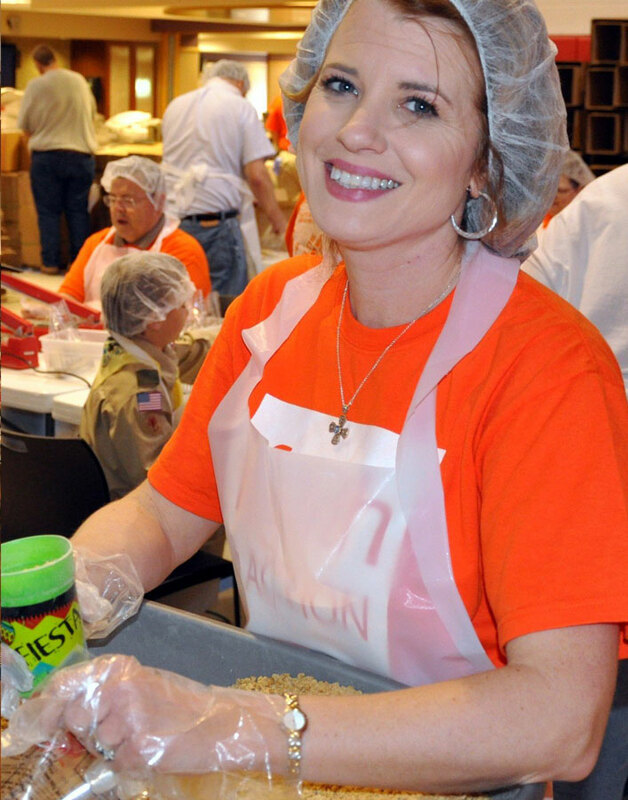 Whether you’re interested in cooking, serving food to homeless families, stocking shelves at a food pantry, organizing food drives, advocating for better access to healthy food … whatever your interest, we invite you to join the team. You’ll receive notifications of opportunities throughout the year, and can choose the times that fit your schedule. Building Team: Are trips to Home Depot and Lowe’s your idea of fun? Do you enjoy seeing new projects taking shape, or fixing things that have seen better days? Are you passionate about people having safe, adequate housing? We’ll have ongoing opportunities throughout the year to assist seniors in our community, build new homes, make home repairs and more. Garden Team: Do you enjoy working outside? Making a yard look beautiful? Growing fresh food for others to enjoy? Helping people who can no longer work in their yards? We’re forming a new team of gardeners, landscapers, cleaner-uppers, etc. We’ll have periodic opportunities to serve throughout the year, so there’s sure to be something that will fit your schedule. Saturday Go Serve is an amazing opportunity to bless others and be blessed by going out into our community to show the love of Christ in real and tangible ways. We challenge you not to show up alone! Grab your family & friends and join us as we spend the morning making a difference by serving our community. Volunteer opportunities will vary month to month. For more information click HERE. Pick up will be between 9-12 on Sunday, Cinco de Mayo! Natalie Toalson has graciously offered to collect orders and help distribute them on Sunday, May 5 with her small group. Anyone wanting tamales can order through Natalie and they will be $15/dozen. Checks should be made payable to “Iglesia de Camino” and payment can be made at the time of pickup. Choices will be pork with chile rojo, chicken with chile verde , and chicken rajas (mild) . Orders should be turned in no later than April 22. Fill a bucket by yourself, with friends, or with your small group (approximately $75 value). Click HERE for a list of supplies and kit assembly instructions. Completed kits can be dropped off by the missions bins at church. They are located on the lower level across from the Dining Hall. PWUMC sponsors three apartments at Hillcrest Platte County. What is Hillcrest? Hillcrest is a transitional housing ministry that seeks to help families and individuals, homeless or nearly homeless, achieve self-supporting and self-reliant status. Hillcrest ministers to singles and families, and you’ll find that the residents range from people who have never learned to budget and need help with lifeskills to people leaving domestic violence situations and beyond. You can learn much more about Hillcrest at their website. What does it mean to sponsor an apartment? Sponsorship responsibilities range from an annual donation to stocking the apartment to cleaning to working with residents. How can I help? There are a variety of ways you can become involved with this ministry. New residents move into the apartment multiple times a year. Each time, we have a team who cleans the apartment from top to bottom, making it a welcoming place for the new residents. Each time a new resident moves in, we stock the apartment with food and personal care items to get them started. Pine Ridge is one of the poorest places in the United States, with over 90% living below the poverty line and a life expectancy rate that is one of the lowest in the western hemisphere. For many years, Platte Woods UMC has been building relationships, and providing hope and encouragement. We now schedule two summer mission trips, during which we provide support for local organizations and ministries. We also connect with the people of Pine Ridge (especially children) through interactive activities, and learning about the culture and history of the Lakota people. At other times during the year, we take up collections to help fulfill needs and provide encouragement. Most notably, before “prom season” we collect donations of dresses and men’s dress clothing, and we collect school supplies before the start of the school year. The trips for the summer of 2019 are scheduled for: June 15 to 22, and July 20 to 27. These trips are open to adults, families, and youth (under 14 must be accompanied by parent or guardian). Please RSVP to stanshipman@prodigy.net. Serving the poor in developing countries in Central America has been a passion for Dr. Marty Kanne and Platte Woods UMC. Dr. Kanne has been going to Honduras and Guatemala since 1989. He and his team of Platte Woods UMC volunteers have built schools, churches, houses and other projects that establish sustaining resources. Platte Woods is sending a mission team to Puerto Rico, April 24 to help rebuild homes that were severely damaged during the hurricane.